There has been a lot of speculation over the last few months that Google and LG would be unveiling this year’s Nexus smartphone by the end of this month, and now a Google event is planned for next week but it may not see a Nexus 5 release. Google has been sending out invites for an event next week on October 24th in New York, and at first when the invites were sent out many believed the unveiling of the Nexus 5 along with the Nexus 10 will be taking place. 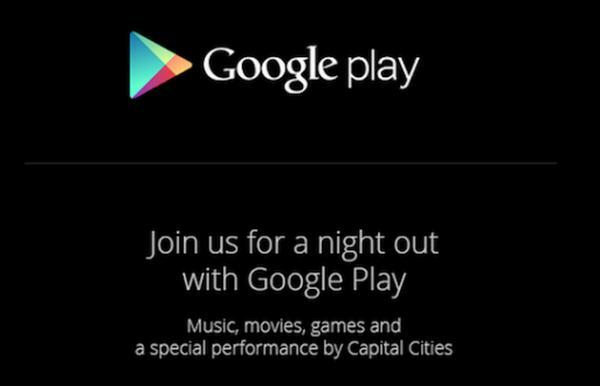 Sources have since claimed that no hardware will be showcased at this event and going by this news and the actual invite we look set to focus on Google Play news. The company looks set to show the world new developments that are related to its media offerings such as movies, games, and movies. The event is likely to be streamed live via YouTube with proceedings kicking off at 7pm and the company must be planning another separate event to show case new hardware this year along with Android 4.4 KitKat. The Nexus 5 has even been seen briefly on the Google Play Store which gave away its pricing so we can’t be much longer away now from seeing the handset launched, and with any luck more will be known by next week’s special event. Are you waiting to see what the Nexus 5 brings before deciding on your next smartphone?